1. Amicalola Falls, located in the Appalachian Mountains near Helen, Georgia, is a ever moving ribbon of tumbling silver. 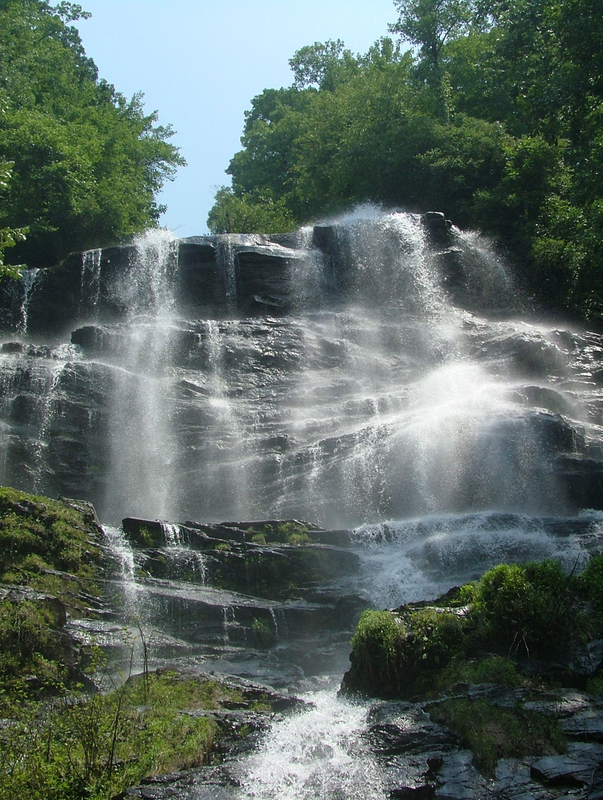 It is the centerpiece of Amicalola Falls State Park. The park offers camping, cabins, a luxurious lodge and restaurants as well as other park amenities. 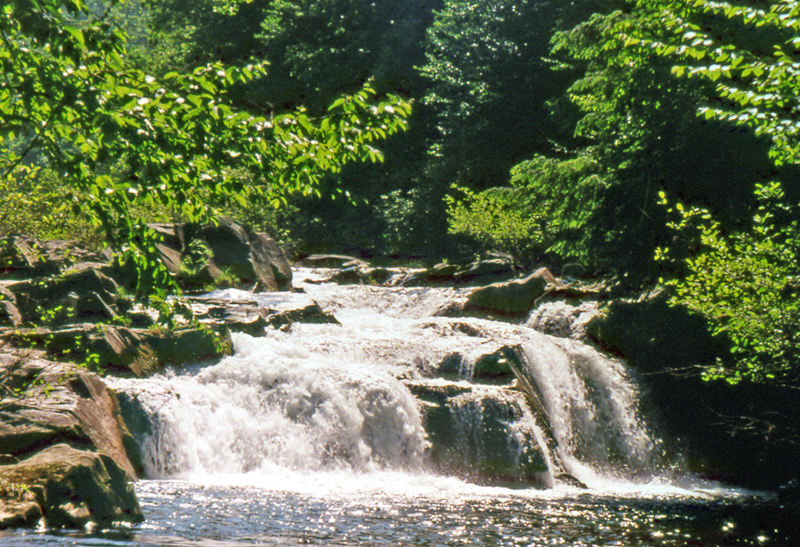 Amicalola is the Cherokee word meaning "tumbling waters." That's certainly an appropriate word for these 729-foot falls, the highest in Georgia. Over a century ago, the Cherokee braves would journey up the mountain on a vision quest. To them the falls were sacred. When the white man came, the beauty of the area caused them to covet it. Today, you can vacation at an impressive stone lodge built high atop the mountain. 2. Okefenokee Swamp From the mountains to the swamp, Georgia's gems are diverse. Okefenokee Swamp, on the Florida line in Southwest Georgia, is America's largest, most pristine swamp. Stephen C. Foster State Park is the perfect place to camp right in the middle of the swamp. 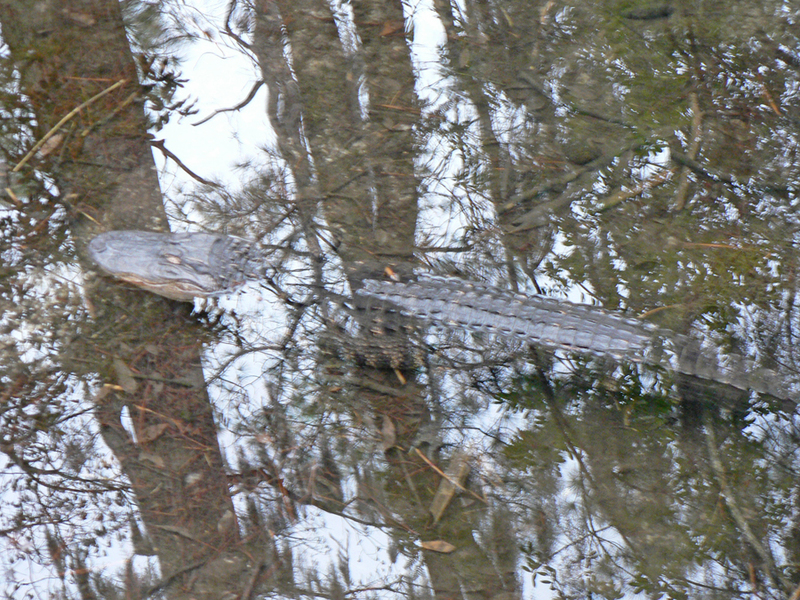 The Okefenokee Swamp Park lets visitors meet some swamp "critters" up close. There are also boat tours and a railroad system. Do stop at the Pioneer Village and visit the reproduction of the Wiles Cabin. The Okefenokee Heritage Center gives you a glimpses of the swamp and surrounding area's history. The train transports visitors back to when Waycross was a rural crossroads and timber center. And Southern Forest World will let you stand inside a giant hollow cypress or climb a fire tower. Obediah's Okefenok was built around the 127-year-old cabin of real life swamp man Henry Obediah Barber. You can hike more than 1,000 feet of boardwalk through the Okefenokee wetlands; the little zoo there combines wild and domestic animals. 3. Providence Canyon is your choice if you always wanted to explore Grand Canyon. It's Western Georgia's "Little Grand Canyon" located near Lumpkin. Nature's artistry is has outdone itself here. The canyon's steep sides are splashed with radiant colors, purest white to deepest purple and every hue in-between. There are more than nine miles of hiking trails. You can choose to hike the rim or descend to the bottom of one of the 150-foot-deep canyons. The best views are along the park's eastern side. To immerse yourself in this experience, try camping and traversing the park's trails over several days. There are primitive campsites along the route, or if you want to RV it, you can stay at nearby Florence Marina State Park just 16 miles west of Lumpkin. The amazing thing about this "natural" wonder is that it traces its beginning to "unnatural" causes. Unlike the Western canyons created by raging rivers, it was formed by bad farming practices in the 1800s. Drainage runoff from farms that had cleared the natural wooded areas for irrigation purposes cut deep ravines in the soft Georgia clay. 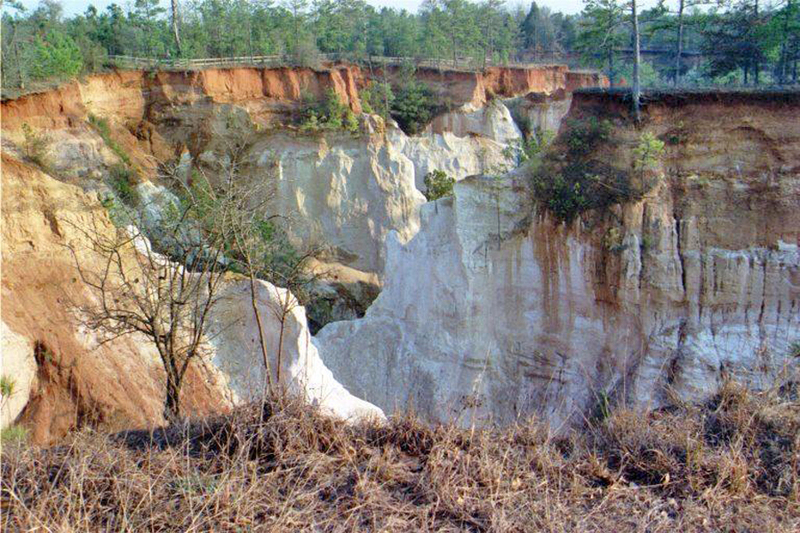 "Providence Canyon State Park is such a surprising place to visit because few people realize it's man-made. I also find it fascinating to walk in a thin layer of water that constantly coats the canyon floor. You're actually walking through the water table," observes Kim Hatcher, public affairs coordinator for Georgia's State Parks. 4. Stone Mountain is one attraction in the Atlanta area that literally towers over all others. 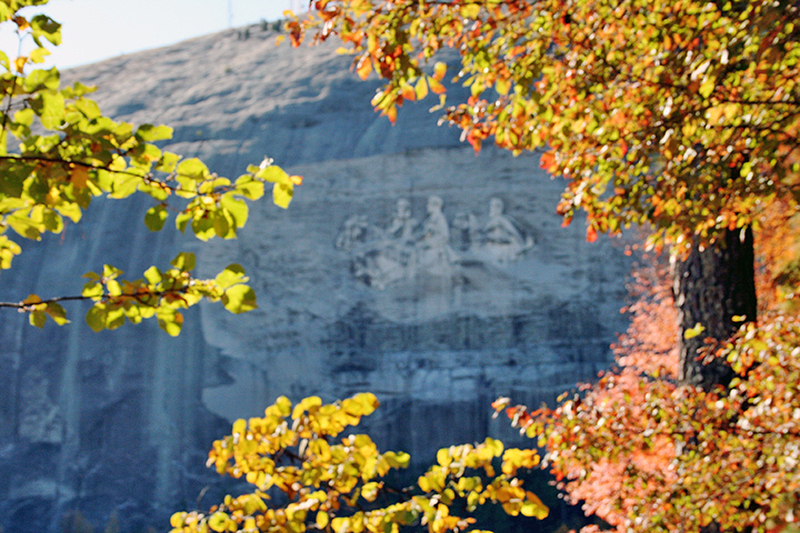 Stone Mountain, the largest granite outcropping in the world with its Confederate heroes carved in giant scale, is eye-candy in the highest form. Native Americans long respected the huge granite outcropping as a mystical healing place with supernatural powers. There is more than the actual mountain to see. There are Antebellum Plantations, Thornton House, a 1790s home of a well-to-do planter that has been moved to the site from Union Point, Dickey House, a Tara-like Greek Revival mansion, and clapboard slave cabins. The Crossroads section of the park is filled with shops and eateries. You can circle the park via its own train. The museum tells the history of this mystical mountain. You can ride the Ducks, enjoy a performance at the Tall Tales of the South Theater, play golf or miniature golf, or just lounge around and watch a spectacular laser show. You can hike or take the SkyRide to the peak. From the top you can see all the way into downtown Atlanta and beyond. 5. Tallulah Gorge is proof that nature doesn't work fast, but the results were worth the wait. 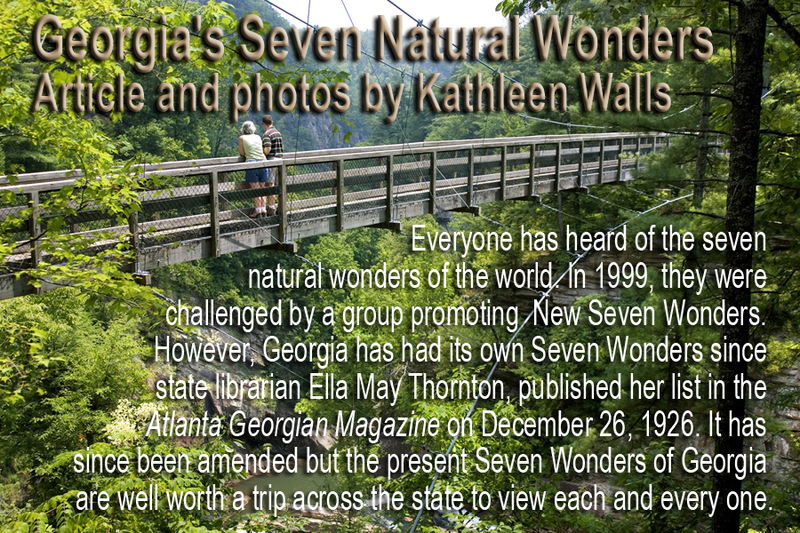 Tallulah Gorge, divides Habersham and Rabun counties. Over millenniums, the Tallulah River eroded the hard quartzite rock of Tallulah Dome into one of the deepest gorges in the eastern United States. Five waterfalls turn the gorge floor into a cascade of sparkling lace as the river drops more than 500 feet in less than a mile. Tallulah Gorge is around two miles long but it crams a lot of scenery into that distance. Known as "Niagara of the South", the dam is opened just five weekends a year, allowing kayakers to experience the white water's fury. Hiking trails are available for all levels of hikers, from the Shortline Trail, paved and easy, to the rugged trail descending to the canyon floor. Exhibits in the Jane Hurt Yarn Interpretive Center showcase the rich history of the town of Tallulah Falls as well as the natural charms of this fragile ecosystem. 6. 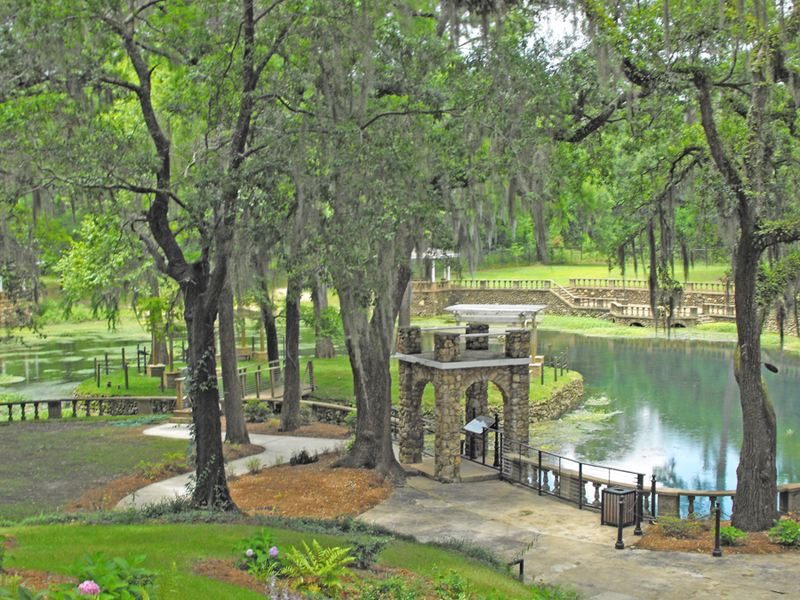 Warm Springs was revered long before the white man settled in this part of Georgia, Native Americans visited the warm mineral springs. They thought of them as a sacred place, a place of healing. Later these healing waters drew settlers. In 1832 David Rose began the first "resort area" in Warm Springs. It became a popular summer resort. Later, in 1893, Charles Davis built a 300-room Victorian called Meriwether Inn. The inn had all the latest amenities and of course the main draw, the 90-degree springs flowing from the hillside of Pine Mountain. At the turn of the century, the resort and the town fell into a decline and were almost forgotten except by the few lucky residents. In 1907, Hotel Warm Springs was built on the site of the oldest building in the town. The hotel changed hands and at one time was named Tuscawilla Hotel after a Creek princess. The owner at that time, Mr. Butts, was so enthralled with the name he also named his oldest daughter Tuscawilla. The name is still part of the hotel history and lore and lives on in the ice cream parlor, known as the Tuscawilla Soda Shop, once frequented by President Roosevelt. It was the former President Franklin Delano Roosevelt who is credited with the town's 20th century revival when, in 1924, he visited the town's naturally heated mineral springs as treatment for his polio-related paralysis. He advocated the name change to Warm Springs to promote the healing mineral springs. Once FDR discovered Warm Springs, he decided to build a cottage there away from the hustle and bustle of politics. He built the modest home that later came to be known as the Little White House while still governor of New York just a year before being inaugurated as president. Here, he was able to escape into the charm of this small Southern town where he took refuge from the pressures of leading a nation during the worst war the world has ever known. It was here that he died on April 12, 1945. He left behind a legacy in which any world leader could take pride. 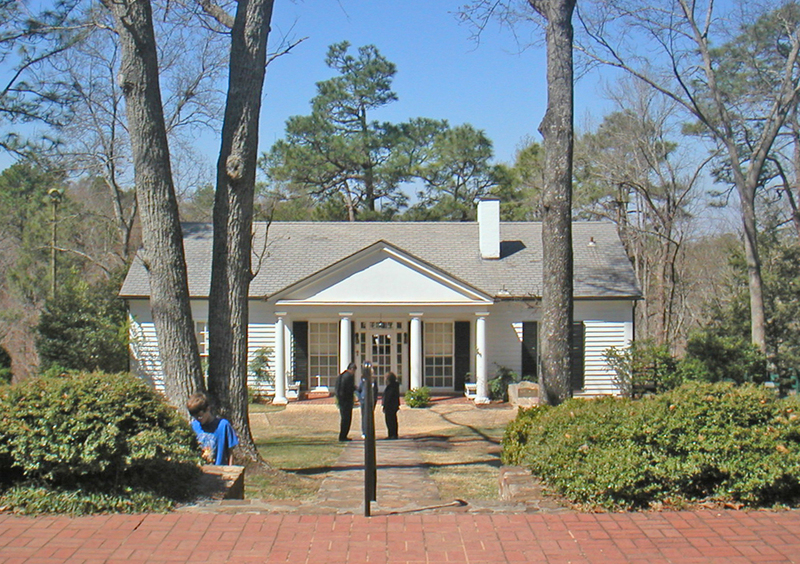 The home is now a Georgia Historic Site and Museum. It was here, while posing for a portrait on April 12, 1945, that FDR suffered a stroke and died a short while later. Today, the "Unfinished Portrait" and many other pieces of Roosevelt memorabilia are housed at the museum dedicated to his memory. 7. Radium Springs is the last of the wonders I visited. It's certainly not the least. It pours 70.000 gallons of water per minute into the Flint River. It's on the east side of the river at Albany. The first thing you notice about the springs is the beautiful blue color of its water. The reason for both the color and the name is a rather unusual one for a place that gained fame for the healing properties of the water. It had originally been named Blue Spring but in the early 20th century, it was found to contain traces of the highly radioactive element radium. The name was changed and wealthy visitors swarmed to the area. Barron Collier, who later developed much of south Florida, built a elaborate casino and resort. Today, you can't (and probably wouldn't want to) swim in the turquoise waters but you will want to explore the grounds where the once magnificent resort stood. The casino was destroyed by two devastating floods but its outline is now the entrance to the beautiful gardens that flourishes there. It's free and filled with natural beauty a hard-to-beat combination nowadays. The Flint river Aquarium in Albany showcases the many verities of life found in the springs.